E.M. 4433/1945 19th March, 1946. At the recent conference of employers at the Central Hall, Westminster it was strongly urged by an employers’ representative that it would greatly assist firms in starting new industrial undertakings in Development Areas if accommodation could be provided for executives in houses of a larger type than local authorities are at present authorised to build or to sanction. This is a question which calls for urgent action as several specific cases have come to my notice where lack of houses for executives and key workers has delayed a firm in starting work at a factory in a Development area. Also the difficulty in finding accommodation for key workers whom must be brought into the area may make a firm decide again going there. Meanwhile as you know, unemployment in the Development Areas is substantial and is rising, and we need to get still more new factories into the areas and to get them going as quickly as possible. 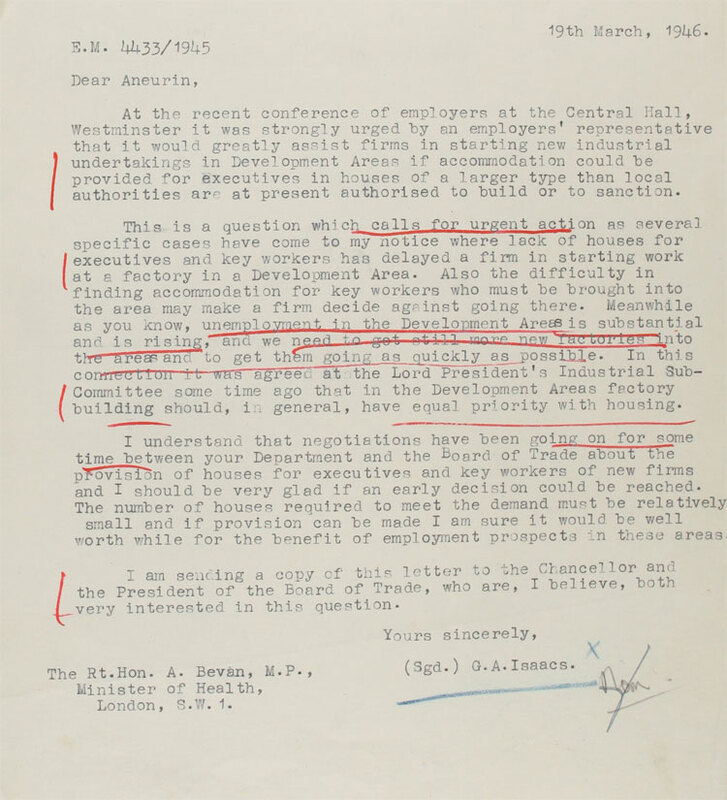 In this connection it was agreed at the Lord President’s Industrial Sub Committee some time ago that in the Development Areas factory building should, in general, have equal priority with housing. I understand that negotiations have been going on for some time between your Department and the Board of Trade about the provision of houses for executives and key workers of new firms and I should very glad if an early decision could be reached. The number of houses required to meet the demand must be relatively small and if provision can be made I am sure it would be well worth while for the benefit of employment prospects in these areas. I am sending a copy of this letter to the Chancellor and the President of the Board of trade, who are, I believe, both very interested in this question.